The Short Version: Based in the UK, AsianD8 introduces and connects eligible Asian singles online and in person. Over a decade ago, the AsianD8 team began organizing speed dating and singles events to engage Sikh, Hindu, and other Asian communities in a fun dating atmosphere. Today, AsianD8 is a leading social resource for any Asian dater looking to enjoy a night out. The full-service dating company also invites singles to date on their own via a trustworthy online network of Asian singles. AsianD8’s niche dating site and free mobile app strives to make dating more convenient and enjoyable for thousands of members of all backgrounds. Busy professionals who’d like more expert dating guidance can sign up for the company’s premium matchmaking services, which streamlines the process of finding a quality relationship. Through an array of dynamic services, AsianD8 offers British Asian singles the chance to meet, mingle, and make a match while having fun. Pali Banwait, the Founder, Co-owner, and Chairman of AsianD8, didn’t let cultural obstacles stand between him and his true love. When he met a fantastic woman through his own dating company in the UK, he didn’t care that she belonged to a different caste. He knew she was the one for him. He went against the wishes of his family members and pushed for acceptance for his choice of bride, arguing that economic status had nothing to do with personal compatibility. AsianD8 Founder Pali Banwait met his own wife through the company’s services. Since it launched, AsianD8’s niche dating site hasn’t allowed members to select caste preferences on their profiles or in searches. The team’s contention is that caste simply doesn’t matter when it comes to personal relationships. Pali’s own marriage shows that the caste system cannot and should not stand between two people who want to be together. For the past 10 years, AsianD8 has brought together Asian singles from across the UK. Hundreds of light-hearted events give young professionals, typically between the ages of 25 and 35, the chance to connect with someone special in their area. What began as a selective speed dating service has since expanded to encompass online dating and matchmaking services as well. 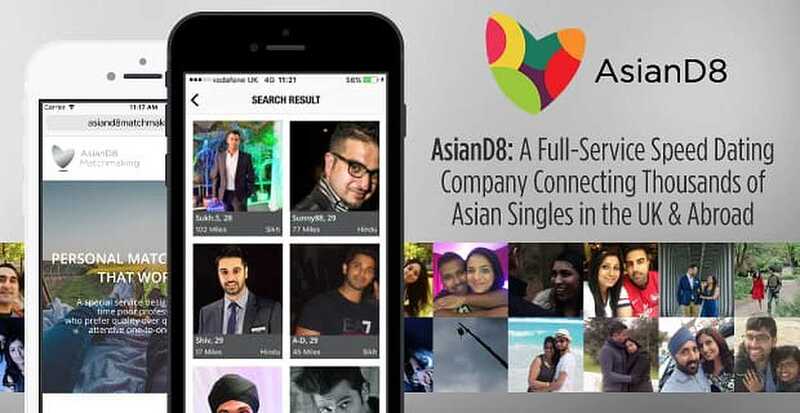 AsianD8’s free mobile app connects a network of British singles on the go and provides an authentic space for building quality connections. You can search by age, religion, or location, to find a date who matches what you’re looking for. Or, you can turn to AsianD8 Matchmaking to hire a professional matchmaker to do the looking for you and arrange compatible dates to save you valuable time. Based out of the UK, AsianD8 holds weekly events for local Sikhs, Hindus, and other Asian singles. The company’s dynamic speed dating events introduce dozens of attendees in one fast-paced and streamlined night. Larger, more general singles events — with mingling, dancing, and a party atmosphere — can attract hundreds of single professionals in one setting. You can look at the calendar to find a fun AsianD8 event held near you. AsianD8 brings Asian singles together in a fun and low-key dating environment. Singles in London, Leeds, Manchester, Birmingham, and Leicester come out to these events to widen their social circles and flirt with eligible men and women in their area. As the UK-based events have grown in popularity, AsianD8 has expanded its dating services to provide Asian singles everywhere with more catered assistance in the dating scene. In recent years, AsianD8 has leveraged its network of fun-loving singles into a successful online dating platform. You can sign up to the dating site or download the app for free and browse through the profiles on AsianD8. When you’re ready to start chatting, you can upgrade to the Plus or Premium memberships, which come with benefits such as unlimited messaging, discounts on AsianD8 single events, and full access to the mobile app. AsianD8 fosters quality connections by authenticating all its dating profiles. The Premium membership offers the most perks for a great value. With this membership plan, all free members will be able to reply to your messages without having to upgrade themselves — that means more date options and less uncertainty. As an AsianD8 member, you can use advanced search and matching features to find a date, send a wave or a message, and form genuine connections online. AsianD8 does all it can to simplify the dating process and add a layer of trust to online dating. The ID check feature offers singles an added level of security and a way to determine if the person you’re chatting with online is genuine. The feature allows users to add details about themselves, which will then be verified by AsianD8 through various databases. After the information has been confirmed, the member will have an ID badge on his or her profile to show date prospects they went the extra mile to be fully transparent and authentic. For South Asian singles struggling with the time investment of dating, AsianD8 Matchmaking offers a professional solution. This unique service saves busy clients the time and the effort of finding eligible dates and quality relationships. A matchmaker can discretely and expertly pair you up with compatible dates handpicked to meet your standards. The three-month package includes in-depth head-hunting, personalized date recommendations, ongoing feedback, and one-on-one date coaching. “We have just introduced personal matchmaking,” Pali told us, “for those people struggling to invest time in attending events or dating on the app.” Matchmaking is a time-saving solution for relationship-oriented daters looking for that perfect match. Over the years, AsianD8 has collected many wonderful success stories from happy couples who met through these streamlined services. The dating site and events make it easy to connect with date prospects and form a lasting bond through shared cultural values. Every day, they create a new love story. 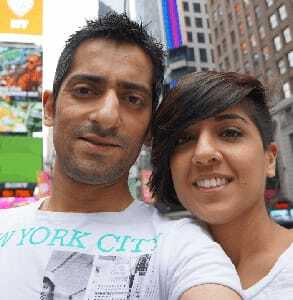 Newlyweds Mandeep and Rupinder were introduced through AsianD8’s singles network. Despite initial butterflies (and a parking ticket), Mandeep and Rupinder got on well on their first date. The two felt an effortless connection. After a whirlwind romance, they got married in August 2016 and honeymooned in Vietnam and Cambodia. In March 2015, Sunny and Priya met on AsianD8 and quickly exchanged phone numbers. A few weeks later, Priya was half an hour late to their first date at London Leicester Square, but Sunny was still taken by her. They ate pizza, walked through the London streets, and had coffee as they enjoyed the summer sun and each other’s company. A year later, they were engaged. “We are now planning our wedding and have booked the venue for the 5th of August 2017!” the couple gushed in their success story. On AsianD8, British Asian singles enjoy many opportunities to meet people with similar cultural backgrounds and values. The company’s premium dating services connect eligible men and women online, at events, and through matchmakers. Whether you prefer mingling in a party-like atmosphere or having your dates arranged for you, AsianD8 endeavors to make dating easier and more fun for relationship-oriented singles. The dating company focuses on quality and compatibility when designing services to match people up. As a dating site and app, AsianD8 is a trustworthy place to come together. You can sign up to the niche network for free and start searching for your ideal partner in no time. AsianD8 provides an open and friendly dating community for Asian singles of all religions and castes.